Of course I'm going to post photos of what I ate. There wasn't Hanson's Ice Cream this year. The temperatures plummeted, although I'll eat ice cream any time of year. Plus, we simply ran out of time. I need to plan, when I pass through again, that one evening will be dedicated to sitting on the back deck eating Hanson's ice cream. While I won't post photos of everything, here are the memorable meals. I must start off with the cupcake. This was the whole purpose for going, celebration. 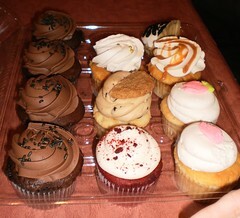 Of course, I forgot to write down the name of the place where they had the cupcakes custom made. April got a "zebra", which was a milkshake flavored cupcake with white buttercream icing covered with black stripes. She's allergic to chocolate so the black stripes were just white icing colored black. 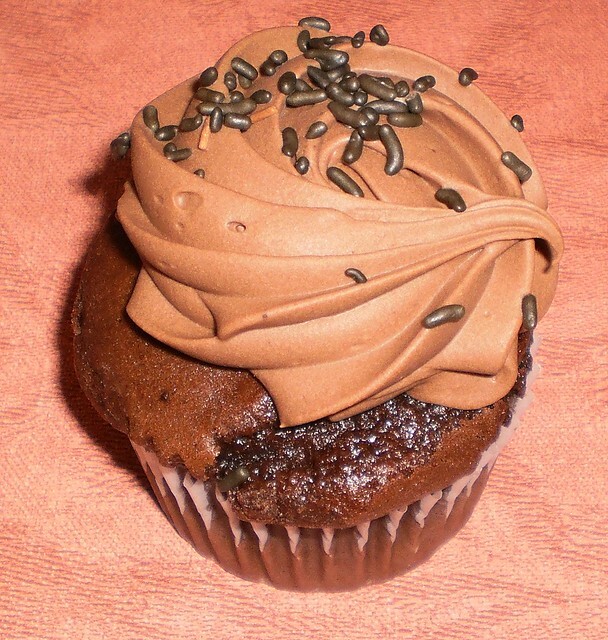 The buttercream icing on the chocolate cupcakes was intensely rich and the cake part was moist and dense. April picked up a random selection for her and Perry when she got the chocolate ones for our celebration. There's red velvet, chocolate chip (which Perry said was kind of lack luster), butter rum and raspberry. Cupcakes are the rage now. On Monday, we went to lunch. I had taken April to Applebee's for supper on Saturday after I arrived. I got an Applebee's gift card for Christmas and this was a great way to say, "Thanks for letting me sleep in your extra room". Sunday, Perry and I went to Perkins for breakfast and then we all went to Bob Evans for lunch. In the evening was the party. So, in the midst of chain repasts, they suggested we go to one of their favorite local restaurants. Yes, that is Mexican. The place is called Salsitas. This lunch, which was just the right size, was only $5.00. 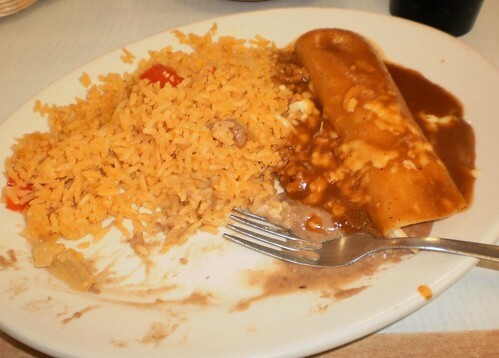 It consisted of Mexican rice, chicken enchilada and refried beans which were so good, I ate them all before realizing I needed to take a photo. I love the decor, which I didn't photograph. It was bright and cheerful, with jewel-toned colors and lots of art work. It's just this storefront in a strip mall. I'm probably glad it's nowhere near me. I'd be there, a lot. The food was excellent, too, by the way. Monday evening is game night. As we'd gotten together for April's party on Sunday night, most of the gang opted not to come back on Monday. Chris came over and we decided pizza was too much. Another local place they have is The Sandwich Factory. We ordered supper from them. 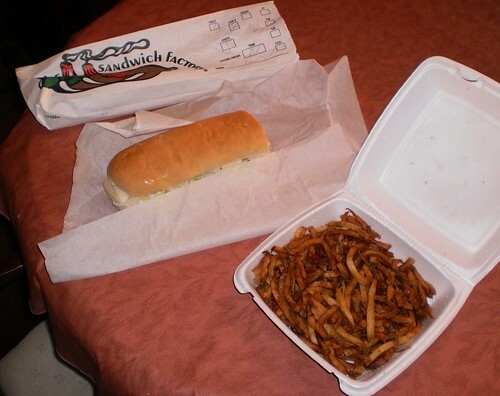 That's an 8 inch turkey and cheese sub with an order of fries. I thought I'd be getting one of those large-size cup things with some fries in it. I never dreamed the fries ($2.40) would be that much. The whole meal cost me $7.00 and I couldn't eat all the fries. I reheated them in the oven when I got home on Tuesday and they were still pretty good. Try that with a fast food joint's fries. The sandwich was really good and I should know since I eat a lot of Subway. Good food and good friends equal a great trip. Handel's ice cream :) and Clarencedale cakes :) the red velvet was good - with cream cheese frosting.